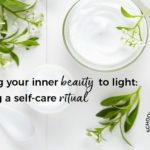 Many DIYers are excited about the prospect of making their own beautiful skincare products that are just as good as those sold by the natural/organic brands but for a fraction of the cost. 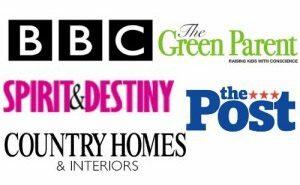 We want to show you that when you know how to do it properly it’s totally possible! Keep reading for our recipe for a Revitalizing Wild Rose and Shea Body Cream that is rich, luxurious and inexpensive to make. Why are products sold by natural and organic brands so expensive? The quality of the ingredients they use. The cost of natural/organic certification. The cost of product testing. And of course, the need to make a profit! 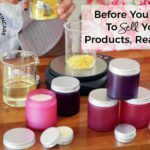 But if you choose to make your own products, it’s much more cost-effective! 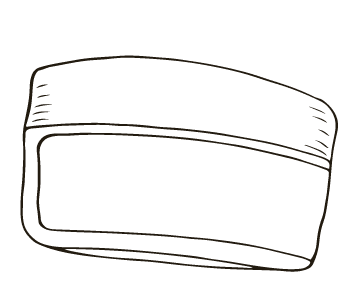 Natural or organic body creams can retail at anywhere between $20 and $50 (or even more) and face creams are often even more expensive. But because they’re usually 60-70% water they can be very inexpensive to make, so you could easily make your own for much, much less. Certainly under $10, possibly around $5, depending on the carrier oils and packaging you choose. 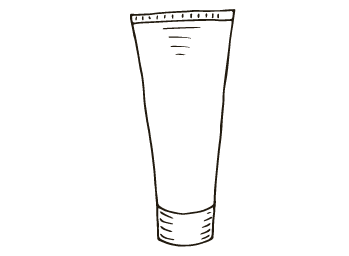 What ingredients are needed in a moisturizing cream or lotion? Before we share our recipe let’s look at the composition of an effective moisturizing cream or lotion. Emollients – to smooth, soften and hydrate your skin, eg carrier oils. 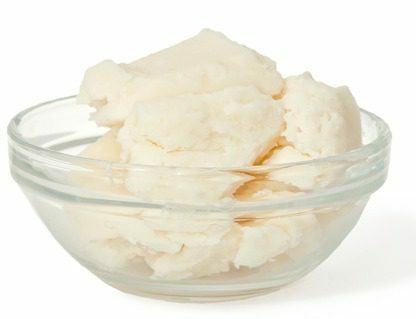 Occlusives – a barrier to block water escaping from the skin, eg shea butter. Humectants – which attract water and bind it to your skin keeping it hydrated, eg glycerin. Water – the solvent for other ingredients, plus provides hydration to the skin. 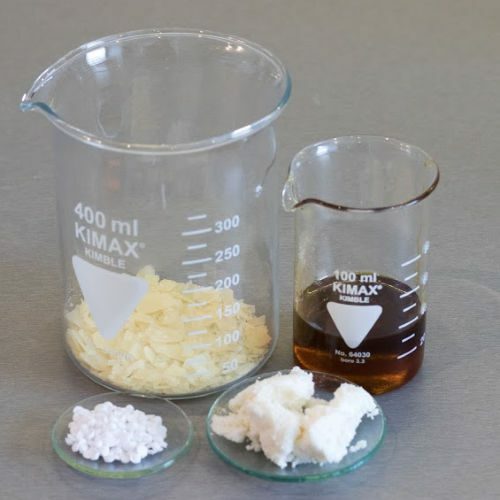 Emulsifier – to combine oil and water, eg Xyliance emulsifier (INCI Cetearyl Wheat Straw Glucosides (and) Cetearyl Alcohol). 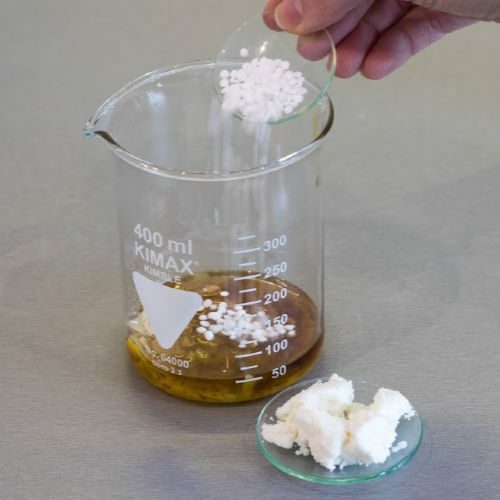 Thickener and stabilizer – to help create a stable emulsion, eg cetyl alcohol (used in the oil phase) or xanthan gum (used in the water phase). Preservative – kills microorganisms and waterborne bacteria and prevents the growth of fungus, mold and yeast, eg Preservative Eco. Antioxidant – to protect against rancidity if using oils with a short shelf life, eg Vitamin E.
When you know how to read a cosmetic label you’ll find these types of ingredients in almost every commercial cream or lotion. You’ll see each of these types of ingredient in the recipe below and in all the formulation templates and recipes we share in our courses. You will however often find them lacking in recipes you find online or in books. This means the creams and lotions could be ineffective, unstable or at worst harmful. 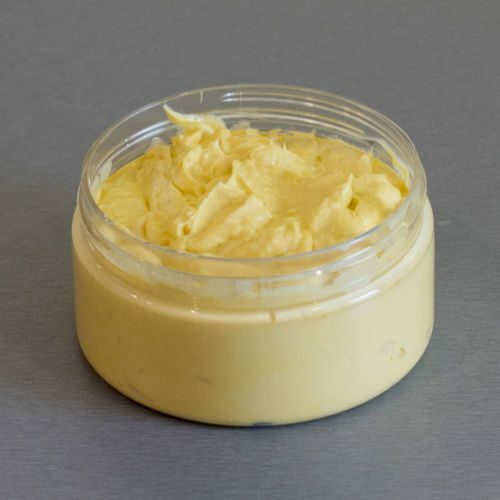 Emulsions are much better at hydrating the skin than anhydrous products like balms and salves. The reason? Emulsions are all-in-one combinations of: water (to provide moisture to the skin); humectants (to attract more moisture to the skin); emollients (to soften the upper layers of the skin); and occlusives (to prevent water from evaporating from the skin). 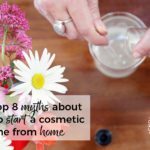 By using balms or salves only, you are completely missing water and humectants as you are only applying emollients and occlusives. This means that if your skin is not well hydrated, long-term use of anhydrous balms can actually make it even drier. This recipe was inspired by the Neal’s Yard Rose Body Cream, a rich, luxurious moisturizer with shea butter, sweet almond oil and avocado oil that retails at £35 GBP (about US $45). Our version contains similar ingredients and has a similar consistency and skin feel, for a fraction of the cost. We’ve even left out the sweet almond oil and included more luxurious carrier oils (macadamia and rosehip) instead! 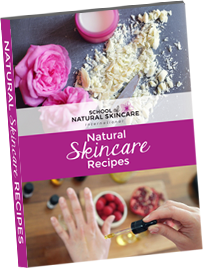 This recipe is taken from our Certificate in Making Natural Skincare Products. 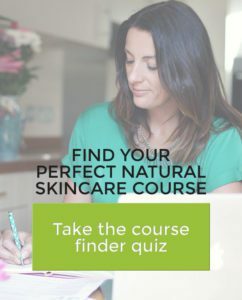 If you’d like to make your own complete skincare range, the right way, for a fraction of the cost of the top natural brands then the course will be perfect for you. Our Revitalizing Wild Rose and Shea Body Cream is packed full of regenerating and nourishing ingredients and is wonderful for dry or mature skin. Macadamia oil is emollient, rejuvenating, soothing, protective and easily absorbed. Avocado is a rich, nourishing oil that is long lasting, easily absorbed and has a wonderful soft, silky feel on the skin. Rosehip oil is well known for its rejuvenating properties. It’s the only vegetable oil to contain tretinoin (a form of vitamin A), which helps to repair damaged skin, acne, and reduce wrinkles and scars. Frankincense and lavender are both very healing and stimulate cellular regeneration. 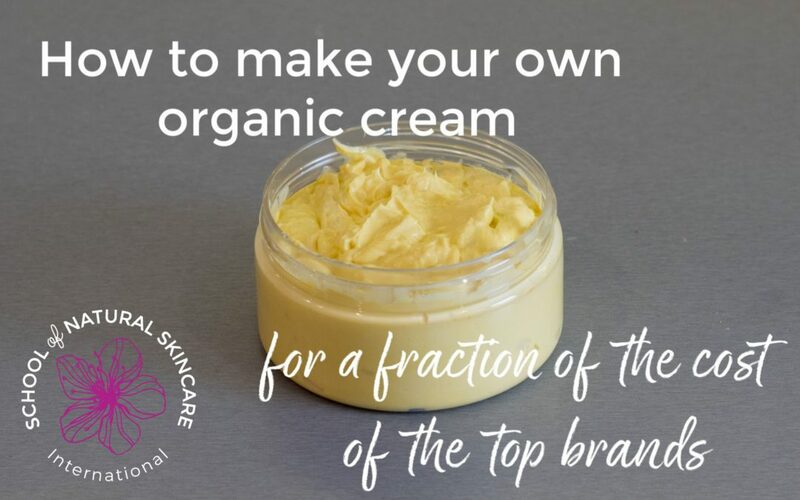 To make an organic version of the cream, you can choose organic carrier oils and butters, naturally derived vitamin E and a preservative approved for use in certified organic products. Click the arrows to see step-by-step how to make the cream. First weigh your water phase ingredients. 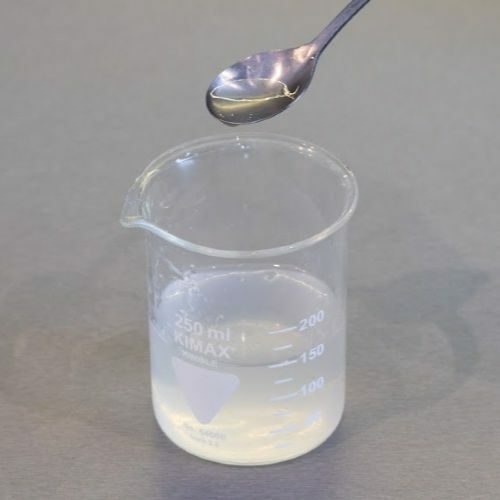 It’s easier to disperse the xanthan gum in the glycerin first so sprinkle the xanthan gum onto the water and blend with a stick blender or mix thoroughly with a spoon or whisk. Pour the the glycerin and xanthan gum mixture into the water. 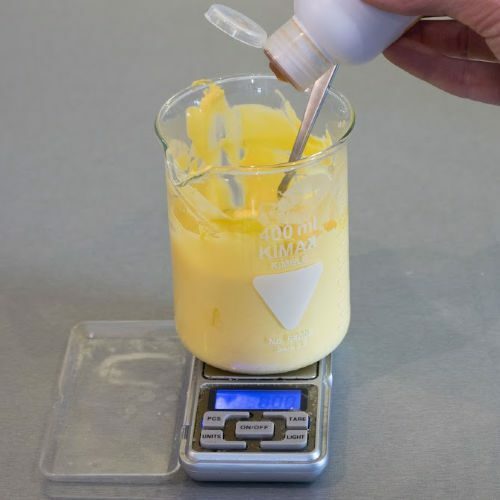 Prepare your oil phase by weighing out the oil-phase ingredients. 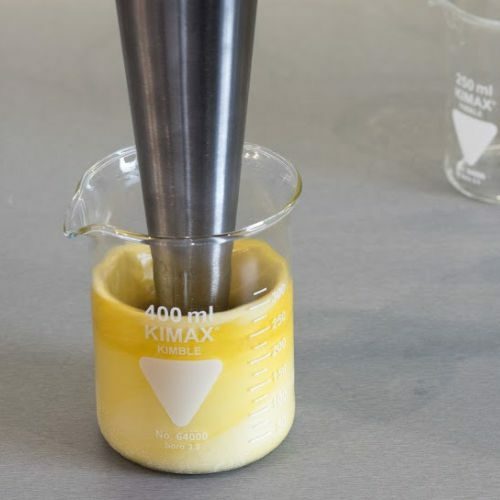 Combine the oil phase ingredients in a beaker. 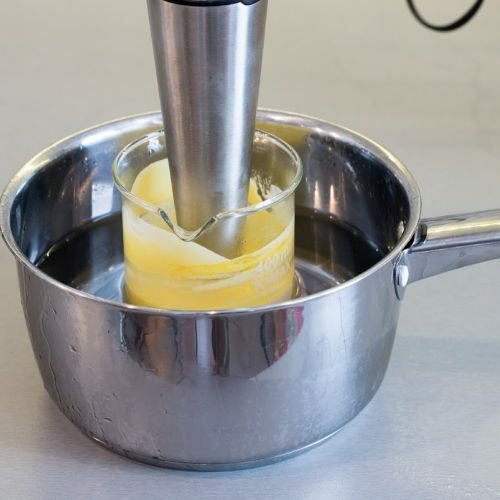 Heat both the water phase and oil phase containers in a water bath/bain-marie until both reach the same temperature (70°C or 158°F), measuring the temperature with a thermometer. You can choose to follow the “heat and hold” method if you like. 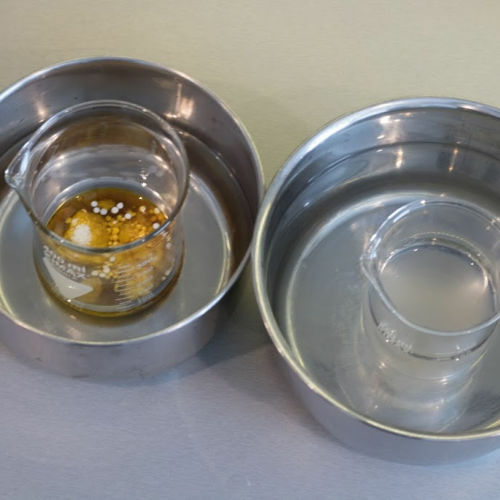 Once both phases have reached the same temperature, carefully remove them from the water bath. Pour the water phase into the oil phase. 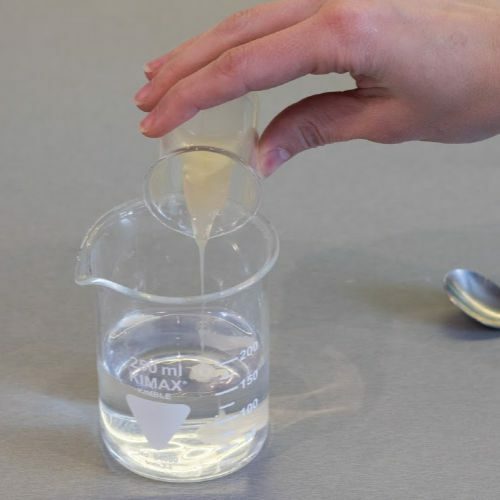 You can also pour the oil into the water however some oil always gets left behind if you pour it that way around! 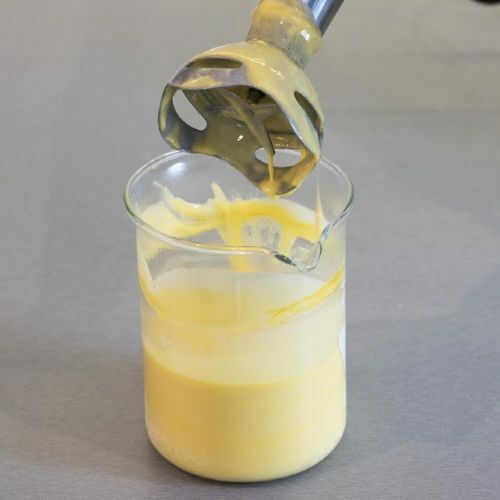 Blend with a stick blender with a few minutes to emulsify. The warm emulsion will still be very fluid. 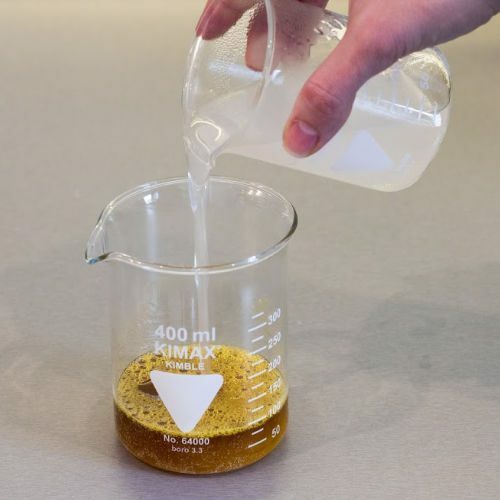 Cool the emulsion down by placing the beaker in a cold water bath (sink or saucepan filled with cold water) and mixing until cool. Once the temperature has reached 40°C (104°F) add cooling phase and mix until uniform. At this point you can check the pH of your product if you wish. If your preservative isn’t too pH dependant then you can likely skip this step. The easiest way to check the pH as a beginner is to spread a small amount of the emulsion on a pH strip and wait 1-2 minutes for the strip to show the pH. Then you can adjust the pH if needed. 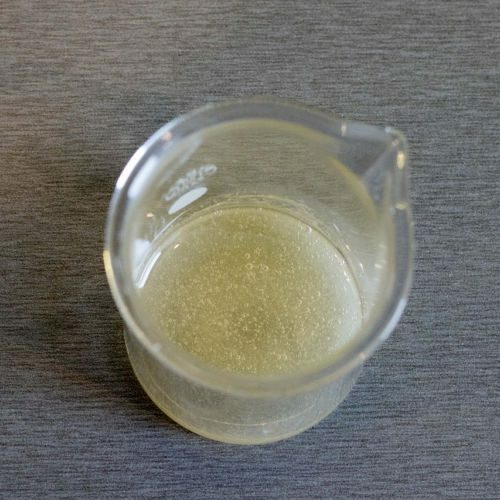 We give much more information on how to test and adjust pH in our courses. Transfer to your packaging of choice and once cooled to room temperature place the lid on. 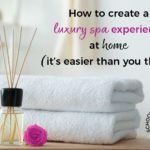 This recipe is just the start of your journey to making your own natural skincare products! 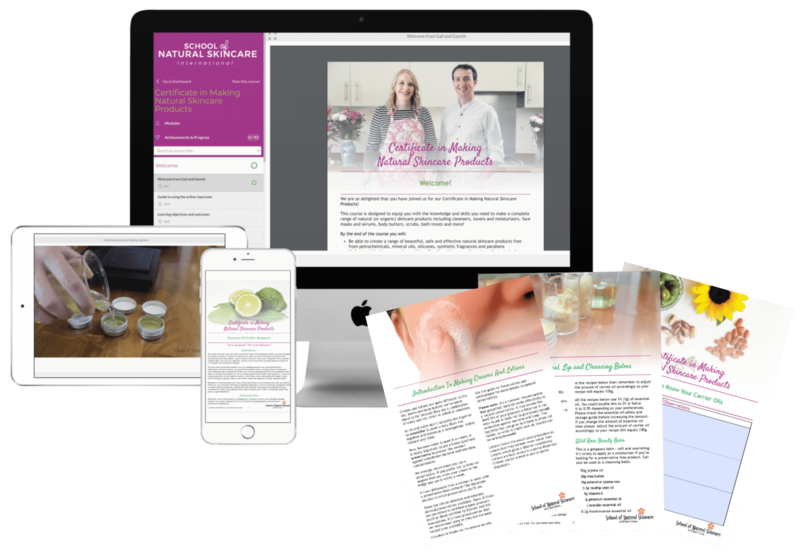 In our accredited online Certificate in Making Natural Skincare Products we include 23 recipes for creams and lotions plus there are 100 other recipes for serums, oils, body butters, lotion bars, face masks, body scrub, facial exfoliators, toners and gels. 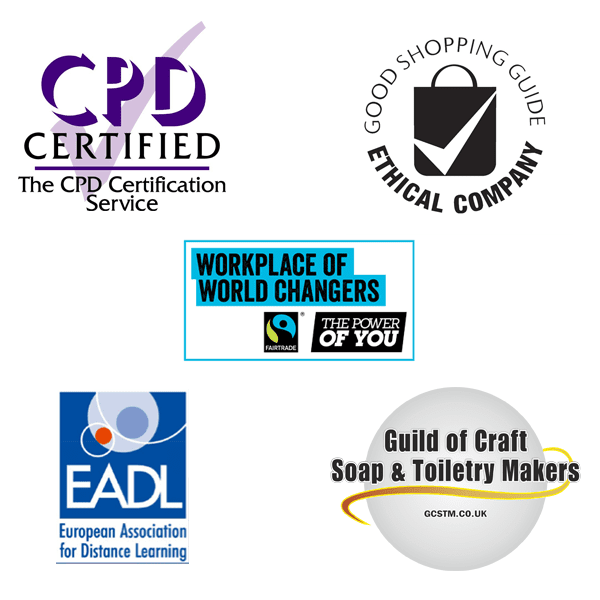 By studying with us you’ll gain a good foundation of knowledge of different types of products, when and why to use preservatives, emulsifiers and antioxidants, detailed information about a wide range of ingredients including their uses and benefits and you’ll get lots of recipes to try out. 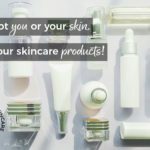 By the end you’ll be able to make a complete range of skincare products with confidence (and customize them if you wish). Plus you’ll be joining our supportive student community and if you have any questions our tutors are on hand to help. You can read what students are saying about the course here. And you can take a look at the full Certificate course curriculum and enroll here.